l Pavithra Srinivasan is a writer, journalist, artist, translator, columnist and an editor and is fascinated with History. There’s an old saying in Tamil: Moorthi sirithaanaalum, keerthi perithu. Something could be insignificant in form, but immense in fame. I’ve come across my fair share of monuments and heritage sights in Madras which would be an accurate representation of the proverb, but perhaps very few fit the description more than the legendary Gem & Co, today an irrefutable part of old George Town. They’re the pen specialists, producing the finest tools in writing since 1920; originally begun by M.C. Cunnan and Venkat Rangam Chetty, they were the purveyors of the unique Gama pens – but the shop itself is unassuming, tucked away amidst a welter of other stores on the busy NSC Bose Road. If you’re not really looking for it, it could easily escape you, rather like one of J.K. Rowling’s magical shops in Diagon Alley. Unfamiliar with North Chennai (at that time), I managed to miss it twice, before finally zeroing in on it. 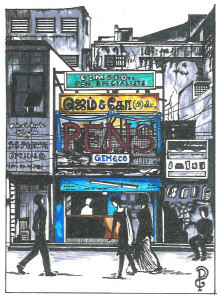 Oddly enough, my interest in this pen company was fuelled, not by pens – but by one of Madras’s most intriguing and horrifying murders: that of Aalavandhar, a man who was summarily dismembered in August 1952 – and who happened to have been a pen salesman with Gem & Co. Once I’d gone beyond the gruesome details about his decapitated head buried on the Royapuram beach, I visited the shop myself, and fell in love not just with its old world charm, but also the incredibly colourful banners and hoardings that announced its presence. Blue, green, yellow and black clashed gloriously in the concrete jungle even as the interiors were a stately brown and black; it was too tempting a combination to pass over. So here it is. Needless to say, I bought a couple of pens as well, in cherished memory.